Here’s a creamy, sweet, chilled dessert that’s arguably more refreshing – and better for you – on a hot summer’s day than a bowl of ice cream. 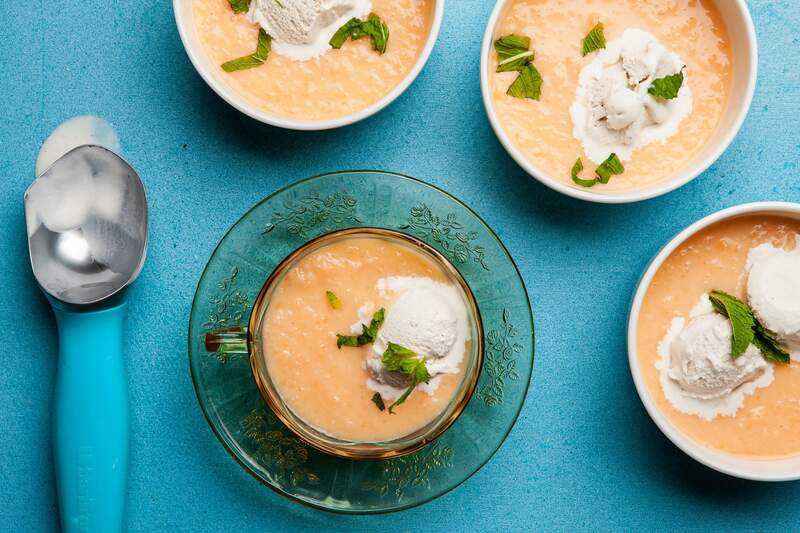 After chilling thoroughly in the refrigerator, the soup is served elegantly in bowls with a small scoop of coconut sorbet and a shower of fresh mint. It definitely tastes like dessert, but one that is exceptionally quenching because it is lighter than it is rich. I don’t mean to imply you need to forgo the occasional ice cream this summer – it’s just that once you have tried this dish, you might find yourself craving it instead. Here, juicy melon is blended with honey, lime juice and coconut milk then chilled and served elegantly with a small scoop of coconut sorbet and a shower of fresh mint. It makes a refreshing dessert on a hot summer’s day. MAKE AHEAD: The soup needs to be refrigerated for at least 1 hour, and up to 2 days before serving. Ingredients:5 cups packed cantaloupe or honeydew chunks (from a 3½-pound melon, peeled and seeded)1 tablespoon honey2 tablespoons fresh lime juice½ cup unsweetened light (low-fat) coconut milk½ cup store-bought coconut sorbet2 tablespoons chopped fresh mint, for garnishMethod:Combine the melon, honey and lime juice in a food processor; puree until smooth. Add the coconut milk and pulse to incorporate. Transfer to an airtight container and refrigerate for at least 1 hour, and up to 2 days. To serve, ladle the soup into individual shallow bowls. Place a scoop of sorbet at the center of each portion, then top with the chopped mint. Source: Adapted from food nutritionist and cookbook author Ellie Krieger.